Characteristics: Very hot, as if the sun was always at its zenith... Very bright! Description: Just like any desert of this name, the Desert Sector is dry, yellow and sandy, anywhere you look. Its plateaux are rocks, covered by a fine sand which gets kicked up when vehicles and monsters travel across it. Very big, upright rocks pierce the plateaux. As the horizon is generally flat, along with the towers, they are the most noticeable elements in the Sector, but we can find several typical landforms in the Desert, such as the oasis. Even around these rare pools, greenery is absent in the Desert! 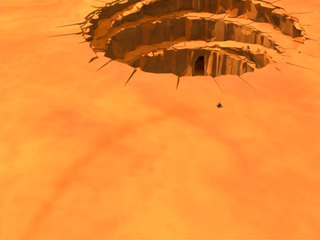 The Desert Sector seems to be the vastest of Lyoko's Surface Sectors! Its second peculiarity is that it is the Sector of Canyons and Pits! Indeed, in multiple places of the Desert are canyons that look like deep trenches which wind long distances in the Sector. They are very dangerous because Megatanks regularly circle around them, devirtualising anyone who doesn't run fast enough! These rabbit holes are sometimes completely underground and lead to sorts of pits! We find two categories: those who don't have a floor and represent deadly wells towards the Digital Sea, and those that do! In the latter, we can sometimes find a tower (episode 1 "Teddygozilla"). When the heroes have their vehicles, they can easily move around and below these craters, but when on foot, they need to take a winding path. 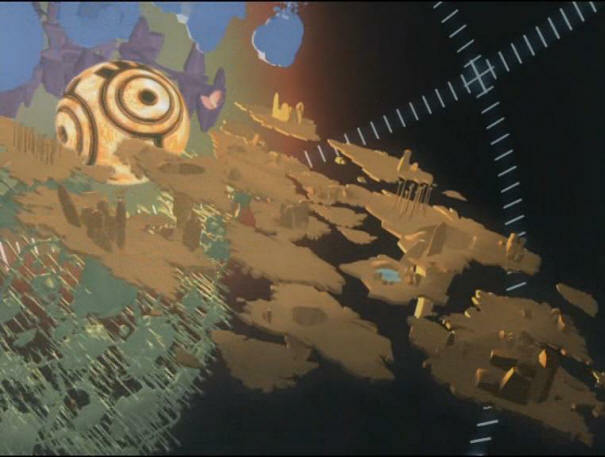 This is why these uncommon places also serve as a prison for Aelita and a stronghold for monsters. For the same reason, the monsters frequently try to destroy the heroes' vehicles in these canyons, forcing them to continue on foot (episode 40 "Attack of the Zombies"). 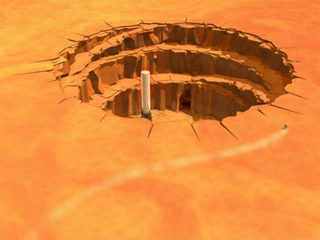 In the Desert Replika (episode 83 "Hard Luck"), we find one of these canyons. It's very original seeing as the trench that cuts through it dotted with rocky columns that must be zig-zagged through. 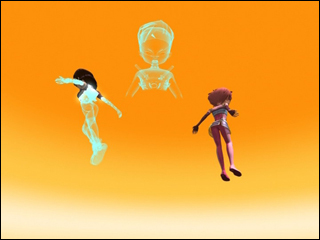 An aerial race between Aelita on the Overwing and Hornets takes place there. Also on the Replika is a smattering of the same rocky elements on a plateau. 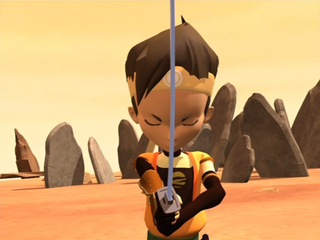 In the same episode, Yumi confronts William, outwits him and manages to hit him twice, then squashing him by knocking a rocky column on top of him. The Desert Replika therefore presents some rather original elements. 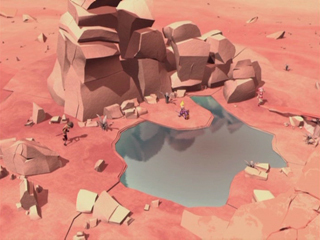 Lyoko's Desert Sector has almost no decorative element, aside from the rocks scattered all over the Sector, excellent for using telekinesis on against Bloks (episode 5 "Big Bug") or even William (episode 69 "Wreck Room"). In certain areas, long, flat rocks are stuck into the ground at various angles. These places are of good use to both the heroes and monsters. They're ideal for confronting a flying adversary, and Odd proves it in episode 33 "Final Mix" as well as episode 69, in which he executes a remarkable trick with his Overboard to kill a Tarantula! The paragraphs above and below reflect that the mostly flat, barren land is the major characteristic of the Yellow Sector. All monsters seem at ease in the Desert Sector. Indeed, if we were to make a board game out of it, it would incarnate much more basic features: vast, flat terrain, most of the time offering a clear view of everything with perfect visibility. 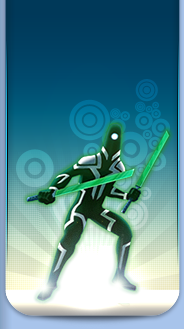 Like the Ice Sector, this suits William, and his best performances were seen in this Sector. He defeats the heroes there on no less than three occasions: in episodes 67 "Double Take", 69 "Wreck Room", 86 "Canine Conundrum", and easily backs them into a corner in episode 75 "Hot Shower". The Replika's stone columns have disadvantaged him, as pointed out above. So we see all monsters in the vast sandy expanses, even a Manta in episode 58 "The Pretender". It's hard to establish an order of preference, but we can note that Bloks almost never appear there. Kankrelats are very good at hiding themselves in the rare dynamic elements, while Megatanks and Tarantulas take advantage of the clear terrain to accost the heroes with their powerful laser fire. Hornets also know how to exploit the large surfaces, coming and going as they please, complicating life for the heroes. The only penalised monster is therefore the Scyphozoa, which appears the least within the virtual Sahara than in the other Sectors. 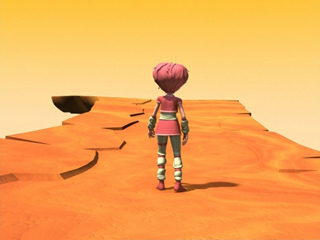 It lacks hiding places from which to look out for Aelita! 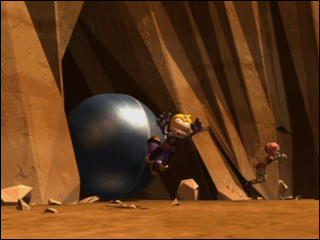 - XANA creates a sand hurricane in the Sector during episode 4 "Log Book". - Ulrich and Yumi's kiss in episode 22 "Routine". 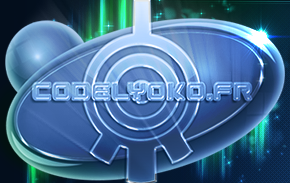 - Discovery of the Tarantula and testing the vehicles in episode 27 "New Order". - Destruction of the Sector during episode 58 "The Pretender". - Reappearance of the Desert Sector. First appearance of new virtual outfits in episode 67 "Double Take". - Discovery of a Desert Replika in episode 81 "A Lack of Goodwill". - Destruction of the Replika in episode 83 "Hard Luck". Access the Virtual Locations gallery!